There’s a certain chill in the air at Dice Hate Me HQ, and a bit more hustle to the bustle out in the big city. That’s right, the holidays are upon us and that means it’s time for our grand holiday tradition – the Dice Hate Me Holiday Gift Guide! We love board games and so do you, so what better way to say happy holidays to friends and family than through the gift of cardboard? Remember, all those games that you give will give right back to you because you get to play them! There are a lot of games out there to choose from, many which you’ve heard us mention on The State of Games or here on Dice Hate Me. This gift guide is meant to give you a few ideas for the gamer and non-gamer alike on your list, and after you check it out you can get even more ideas from the 2010 and 2011 Gift Guides! May you always roll sixes, may your resource cubes be plentiful and may your holidays be merry and bright! With the possible exception of Burger Joint and Piece of Cake, no other game has made me more hungry than Morels. The best thing about that hunger is that it extends beyond the delicious mushrooms and into the savory gameplay; after dining on this fairly unique set-collecting card game, you’ll be eager for seconds. 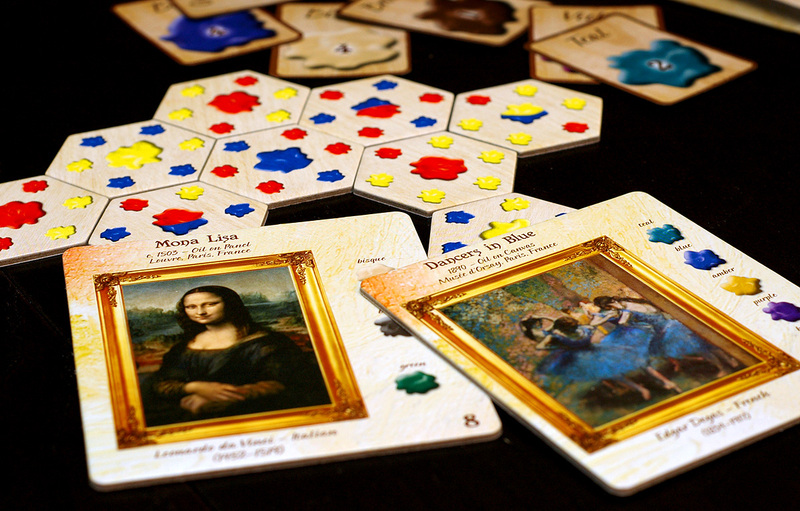 The game is also a delight on the table, with wonderful production quality and beautiful art. My copy of the game even came with tiny, hand-carved foraging sticks and an itty-bitty frying pan. Unfortunately, Two Lantern Games is sold out of those accessories, but designer Brent Povis is bringing them back for a limited time this spring! 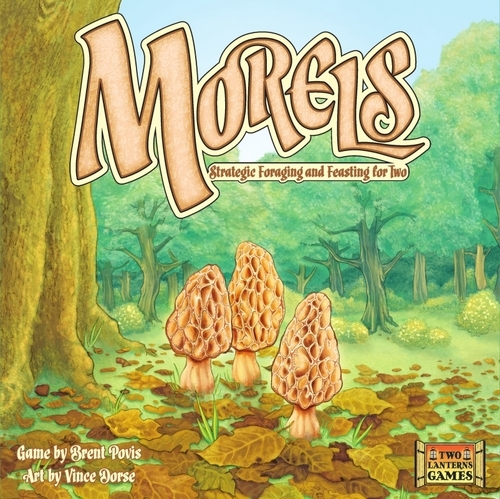 Morels is a game for 2 feasting foragers, ages 10 and up, by Brent Povis for Two Lantern Games. It retails for $24.95, and you can get it online at Two Lantern Games or check for it at your friendly local game store. For the past two years, the holidays just don’t seem complete without a whimsical Alf Seegert title on the table. Last year it was the amazing press-your luck masterpiece The Road to Canterbury. 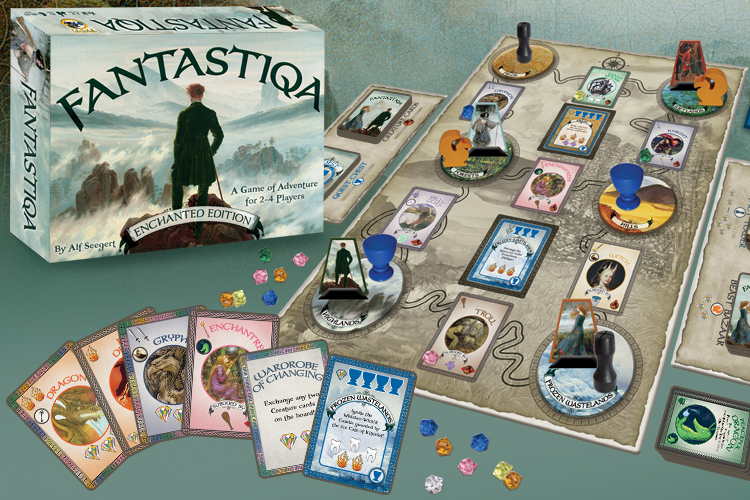 This year, Alf is back with more whimsy and wonder with Fantastiqa, a deck-building exploration game set in a fantasy world filled with creatures, places and things from classic literature. Players take on the roles of adventurers that have been transported to the magical realm where everyday objects like a toothbrush can become a magic wand, and a bike helmet has a lot in common with a hard-headed billy goat. Gamers who are looking for something just a little bit different this holiday will feel right at home in the world of Fantastiqa, as will lovers of deck-builders who are a tiny bit tired of counting up how many actions they have left after playing two Markets, a Village and a Feast. Fantastiqa is a game for 2 to 4 adventurers, ages 8 and up, by Alf Seegert for Gryphon Games. It retails for $69.99 (there’s a lot in the box), and you can order it online from Gryphon Games or check for it at your friendly local game store in December. Nothing says holiday cheer like a little Cthulhu and cultists! 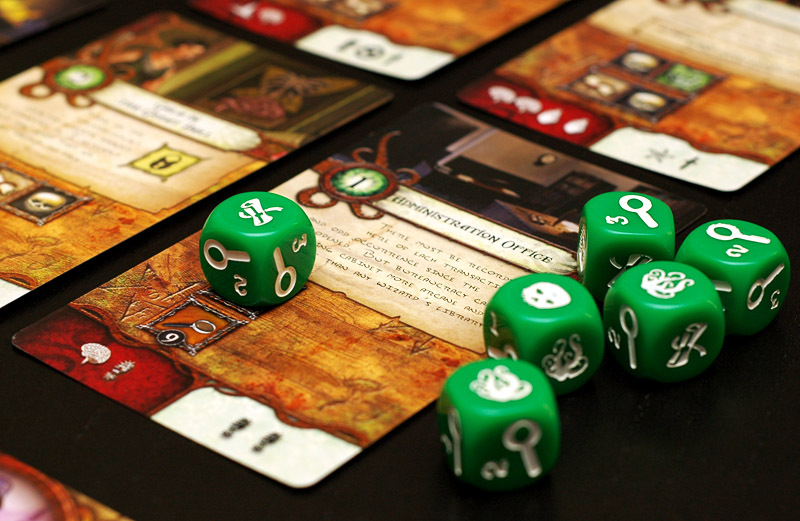 And nothing says fun with dice quite like Richard Launius’s Elder Sign. This cooperative gem is set squarely in the world of H.P. Lovecraft’s Cthulhu Mythos – or, more specifically, the world of Fantasy Flight’s Arkham Horror. As such, players familiar with Arkham Horror get to take on the roles of some of that game’s classic investigators and work together to thwart the machinations of the Great Old Ones who would like nothing better than to make a Thanksgiving meal of the Earth and everyone on it. The custom dice are your weapons of choice in this terrific title, and you’ll be standing on your feet during some of the rolls. And since it’s cooperative, the more seasoned Mythos veterans can ease novice family and friends into the dice-rolling, Byakhee-slaying mayhem. It worked with my mom – I’m sure yours will love it, too! Elder Sign is a game for 1 to 8 intrepid investigators, by Richard Launius for Fantasy Flight Games. It retails for about $30 and you can pick it up online at Amazon.com, or at your local game store, Barnes & Noble, or Target. For more information, check out the official Dice Hate Me review! If you’re looking for more dice-rolling fun, you also can’t go wrong with Garden Dice (locally grown! ), Lords of Vegas, and Airships. Check ‘em out! Without a doubt and without reservation, I love this game; I also happen to like fishing, but that’s beside the point. In Fleet, players use cards in multiple ways – to launch boats, captain those boats and pay for licenses that allows them to launch more boats and gain special abilities. The game’s primary mechanic is building an efficient fishing engine with which to gain more cards and more fish, which are worth victory points at the end of the game. That said, the game also has a very quick and sometimes very brutal auction phase whereby wily fishermen acquire the aforementioned licenses. For some, the theme may not entirely connect, but in the end the gameplay will still hook just about anybody. 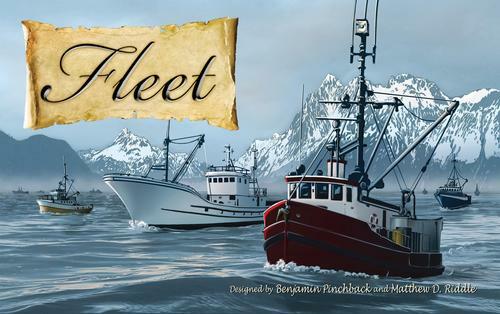 Fleet is a game for 2 to 4 fisherpeople, ages 10 and up, by Matt Riddle and Ben Pinchback for Gryphon Games. It retails for $24.99 and you can get it online at Gryphon Games, or at your friendly local game store. Tell ‘em Dice Hate Me sent you! For more information, check out the official Dice Hate Me review! 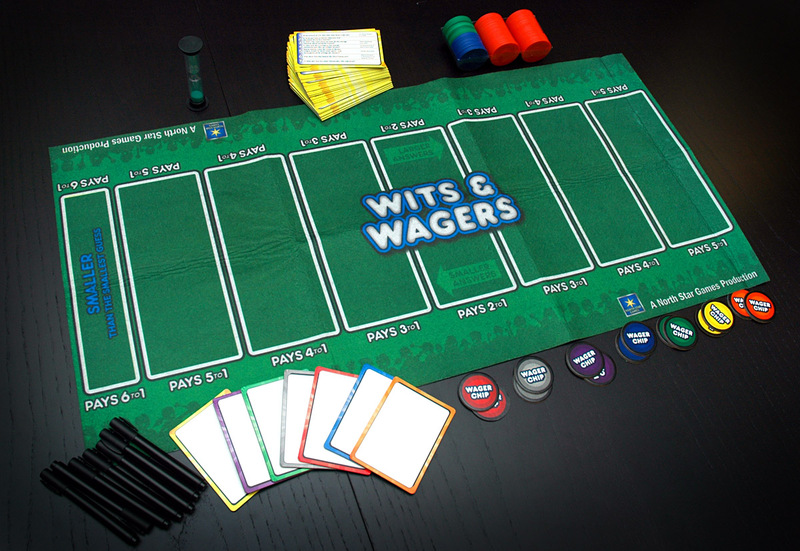 While some may not consider Wits & Wagers a party game in the traditional sense, you’ll still have a lot of fun with a lot of people as you laugh at some of the insane answers given during the game. Wits & Wagers is a trivia game, but don’t let that scare you off; each player writes down their always-numerical answers and then they are ranked from low to high on the game board. Then players have a few seconds to decide how many chips to put down on up to two answers that they think are closest to the correct answer without going over. Sure, you get a bonus if your personal answer is closest, but you get a much bigger payout for those crazy longshots that are closer to the highest and lowest spots. In Wits & Wagers, it’s not so much what you know, it’s knowing when to play the odds and how best to multiply those coveted chips. Wits & Wagers is a game for 3 to 7 guessers, ages 8 and up, by Dominic Crapuchettes for North Star Games. It retails about $30 and you can find it just about everywhere. Look under the couch – it might even be there. For more information, check out the official Dice Hate Me review! 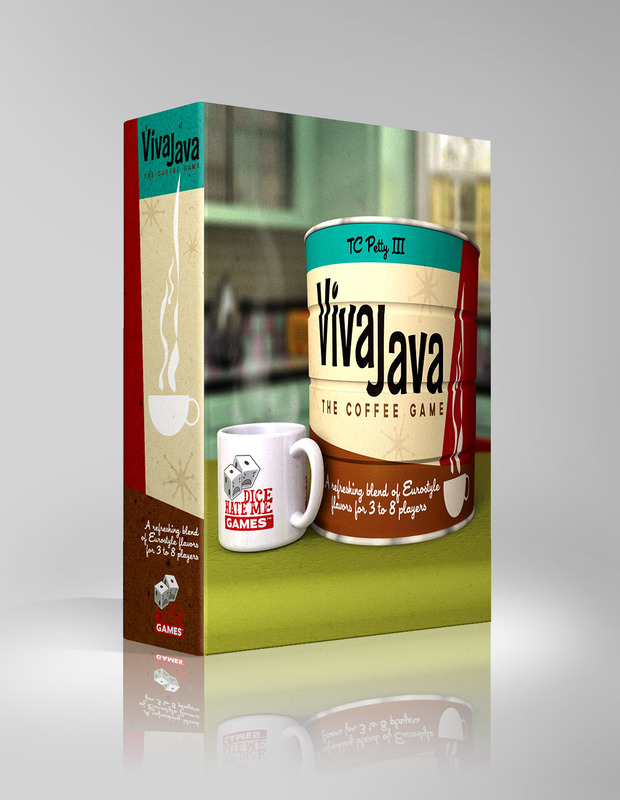 Ok, so shameless self-promotion aside, VivaJava is the perfect gift for the holidays. Why? Allow me to illuminate. First, there’s coffee. Who doesn’t love coffee during the holidays? Second, there are eight canvas bags in the box. Eight. Most games have one single, pathetic little bag. We have EIGHT. Third, there’s wood. Lots and lots of wood. Beans, people! Little wooden coffee beans. And who doesn’t love little wooden coffee beans? Probably terrorists. And you don’t want them to win during the holidays, do you? And lastly, it’s a terrific way for you and 7 of your closest loved ones to show each other just how much you truly love them by cooperating together to create delicious coffee blends – until it’s time to stab them in the back and take the victory for yourself. And really, isn’t that we all want during the holidays? VivaJava is game for 3 to 8 caffeine addicts, ages 12 and up, by T.C. Petty III for Dice Hate Me Games. It retails for $55 (but there’s enough wood and cardboard in there to build a small coffee shop), and you can get it online right over here, or ask your friendly local game store for a copy. If they don’t have it, ask them why they want the terrorists to win. For more information, check out the official website for a video tutorial! Never has a name for a game been more appropriate than with Little Devils. In this trick-taking card game, your mission is to be the one with the fewest “Little Devils” in your score tally at the end of the game. Those Little Devils are on certain cards that are won in tricks during the game. Each round, the player who last took a trick plays any card from his hand. The next player then plays a card higher or lower than that card. The next player must play a card with a number higher or lower than the original card depending on which way the second player went. After everyone has played a card, the player whose card is highest or lowest takes the trick – and any Little Devils on them. After that, there’s usually mild profanity. 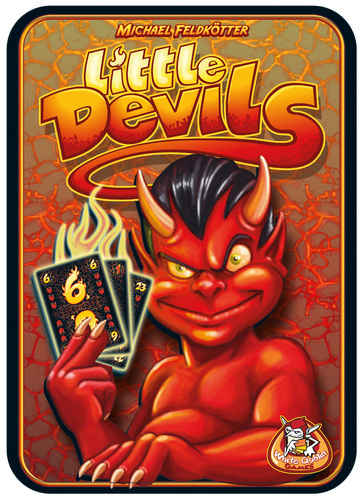 Little Devils is a game for 3 to 6 little devils, ages 8 and up, by Michael Feldkötter for Stronghold Games and White Goblin Games. It retails for about $15 and you can get it online from Stronghold Games or at your friendly local game store. 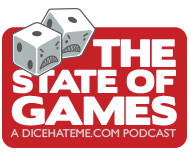 For more information, check out the Dice Hate Me guest review! Also recommended: Farmageddon and Onirim! Anomia is named after a type of mental disorder that makes it difficult for people to recall words or names. It’s extremely appropriate, as you’ll often be stricken with anomia while playing this hilarious game of cards with words. Players draw cards from a face-down deck; if the symbol on the card just drawn matches the symbol on a card in front of another player, those two players race to name one thing associated with the words on the cards in front of the opposing player. For instance, one player might have a card that says “Rock Opera” and another player has “Astronaut.” If player one screams out “Neil Armstrong” before player two can think and say “Tommy,” they win the round and take the cards as points. It sounds amazingly simple, but trust me – when the heat is on, you’ll likely spend much more time pointing at a card and saying exactly what’s on it without a single answer in your head. Hilarity guaranteed. 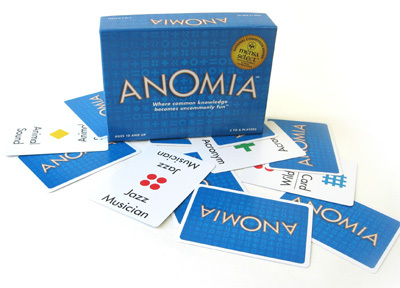 Anomia is a game for 3 to 6 what’s the word?, ages 10 and up, by Andrew Innes for Anomia Press. It retails for around $16 and you can find it online at Amazon.com and at many fine toy stores and bookshops. Nostalgia can be a powerful thing. 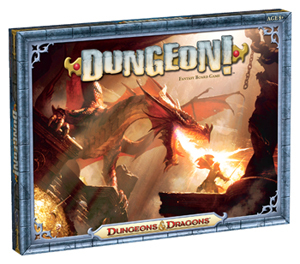 Case in point: the newly-reprinted classic Dungeon! that many a child of the 80s cut their dungeon-crawling teeth on. Back in the day, my friends and I played my copy of Dungeon! so much that some of the cards started falling apart. When a new print was available in the early 90s I bought it again. And it’s very likely that I’ll buy this shiny new version, as well – especially since Wizards of the Coast wisely left the classically-simple gameplay alone and just focused on art that wasn’t scribbled on a cocktail napkin. With easy rules and all the classic dungeon-dwelling staples in the skinniest box I’ve ever seen, Dungeon! will make any child – and child of the 80s – grin from ear to ear when they see it under the tree. Dungeon! is a game for 2 to 8 dungeon crawlers, ages 8 and up, by Chris Dupuis, Michael Grey, Larry Kessling and Gary Gygax for Wizards of the Coast. It retails for about $25 and you can pick it up online from Amazon.com and from your local game store or Barnes & Noble. For more information, check out the Dice Hate Me mini-review. First of all, any game with giant inflatable clubs is going to be a fun time after getting loopy on some eggnog. On top of that, Ugg-Tect makes you bark out orders to other players solely in grunts and a limited caveman lexicon made up of nonsense words and body gestures. The purpose of the clubs, grunts and shimmies is to get your team of other cavemen to build a specific structure out of thick, wooden blocks before the other cavemen do. It’s an incredibly simple concept that results in a whole lot of people looking like the eggnog was spiked with much more than brandy. Oh, and one more thing: you aren’t supposed to use the clubs to club the opposing team, but the rules don’t say not to – so you can read between the lines there, wink wink. 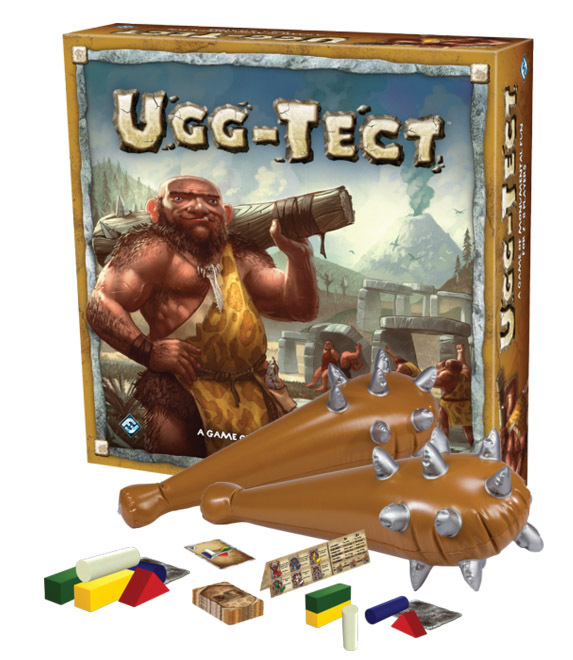 Ugg-Tect is a game for 4 to 8 cavepeople, ages 8 and up, by Walter Obert for Fantasy Flight Games. It retails for about $30 and you can buy it online at Amazon.com or from your friendly local game store. For more information, check out the Dice Hate Me mini-review. Does your mom have a coffee cup covered with Monet’s Water Lilies? Is her bedtime reading material the MOMA gift catalog? Did she name you Edward because she’s a huge fan of Nighthawks? If so, then she’ll go nuts just seeing the box for Pastiche. And even if your mom wouldn’t know the difference between the Mona Lisa and Lisa Simpson, chances are she’ll have a great time with this artistic game of painterly set collection. The goal of the game is to place little hexes with primary colors on them in certain combinations to make more complex colors. Collect all the right colors and you paint a specific historical masterpiece, earning victory points depending on the colors and complexity. Pastiche can be a lot like putting together a puzzle – and a very beautiful and engaging one, at that – so moms with a penchance for anything jigsaw will also love it. Pastiche is a game for 2 to 4 painters, ages 10 and up, by Sean D. MacDonald for Gryphon Games. It retails for about $50 and you can buy it online at Gryphon Games and from your friendly local game store. For more information, check out the Dice Hate Me review! I know it’s a bit unconventional, but I always like to have at least one game in the holiday gift guide that might make some tempers flare. There is method to this madness, however – there’s usually at least one small tiff at the family gatherings, and if you can just go ahead and get it all out at the table and on an even playing field, there’s less chances for the tree to get knocked over during some hair pulling. Cosmic Encounter is the perfect game to facilitate some of that – but all in a classically goofy, endearing, and healthy atmosphere. Cosmic Encounter’s easy rules do an excellent job of getting out of the way for all the social wheeling and dealing that goes on between all the aliens with their unpredictable and, sometimes, unsavory special powers. With its enduring gameplay and cult-like status, Cosmic has been starting and resolving fights since 1977; plus, it’s cheaper than a therapist! 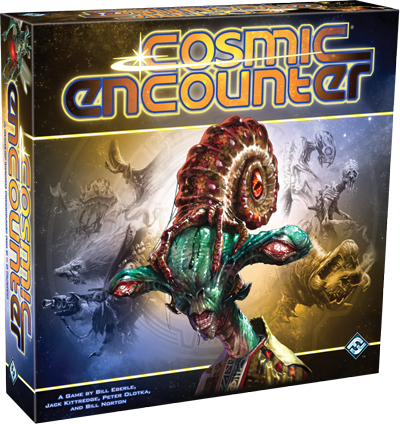 Cosmic Encounter is a game for 2 to 6 hostile aliens, ages 10 and up, by Bill Eberle, Jack Kittredge, Bill Norton, and Peter Olotka for Fantasy Flight Games. It retails for about $50 and you can find it online at Amazon.com, or from your friendly local game store or Barnes & Noble. I recently discovered this wonderful little bidding game a few weeks back while visiting game designer Benjamin Rosset and I immediately went out and bought it. The beauty of For Sale lies not only in the simple and straightforward rules, but in the ingenious “flop” that happens mid-game. At the start of the game, players spend a few rounds bidding on real estate cards that are turned face up in the middle of the table. Each card has a number – the higher the number, the more valuable the card will be during the second part of the game. After all the real estate cards are gone, the flop occurs. Players now try to sell their real estate for the best price on the market. Players take the real estate cards they won and choose one each round to place face-down in a simultaneous blind bid for money cards that are now randomly revealed. The highest-ranked real estate card takes the highest money card, and the game continues until all money cards have been revealed and taken. The richest player wins! Really, though, everyone who plays this simple, quick and addictive modern classic will feel like winners in the end. 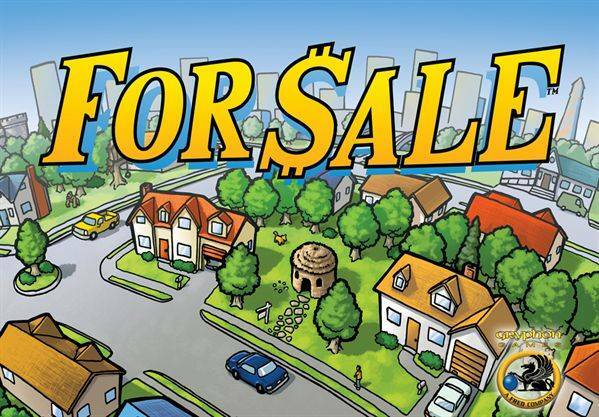 For Sale is a game for 3 to 6 real estate moguls, ages 8 and up, by Stefan Dorra for Gryphon Games. It retails for around $25 and you can buy it online at Gryphon Games or from your friendly local game store. For sale is soooooo good. Indeed it is, Matt. Almost as good as Fleet. Almost. Gamer’s Armory is soooooooo good.